Two layers of soft, lightweight MicroSpring Textile™ form a loose-fitting tube that stays in place to protect fragile skin from pressure, friction and minor traumas that result in tears, bruising and minor abrasions. Unlike traditional fabric sleeves that are tight and binding, the layers of microfilaments allow air-flow and moisture transfer. Simply slip the tube over the arm, there are no hook and loop fasteners or tight fitting spandex. The narrower end of the tube gently rests on the wrist to keep it from falling off. The cross microfilaments in the MicroSpring Textile™ allows these soft tubes to be self-supporting - they won't slip down or bunch up. 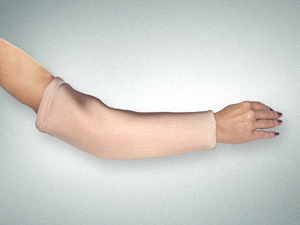 The SkinTubes are designed to fit loosely on the arm or leg. Insert wearer's hand or foot in wide part of tube and gently slide on so that the narrow part rests on the wrist or ankle. Do not roll on. To remove grasp the narrow end with both hands and gently slide off of wearer's arm or leg. DO NOT ROLL UP WHEN APPLYING OR REMOVING THE TUBES.